graphic novel, Maus, by depicting a Jewish minority as mice, victimized by anti-semitic cats. An American Tail makes no point of the essential Jewishness of the Mousekewitz family, but treats them simply as part of the wave of European immigrants that swept over America in the 19th century (but depicted as funny animals). Fievel, their young son, represents the first generation of such immigrants — the ones who were born in the Old World, but grew up in America. Fievel's voice was provided by Philip Glasser (who later did the voice of one of Bebe's Kids). Those doing the voices of Papa and Mama, Nehemiah Persoff and Erica Yohn respectively, had no other roles in animation, but extensive credits as face actors. Others heard include Dom DeLuise (also heard in The Secret of NIMH and All Dogs Go to Heaven), Madeline Kahn (A Bug's Life), Pat Musick (also in Duckman and The Tick) and Hal Smith (Davey & Goliath). 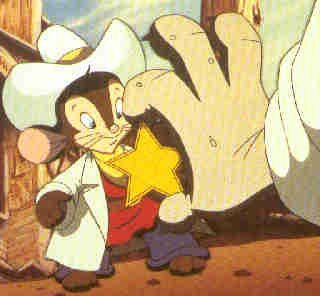 The Mousekewitz family story continued in An American Tale: Fievel Goes West (1991), in which the family continues its migration westward; and in a Saturday morning TV series, which lasted only one season. Two more feature-length films were made, but they went straight to video. The two features, and the Fievel character in particular, were heavily merchandised, profitably so. To date, however, they have spawned no monthly comic books, no daily newspaper strips, no Big Little Books. But the films themselves have proved popular in the video market, so Fievel's story isn't over yet. Text ©2000-10 Donald D. Markstein. Art © Don Bluth.